You could be forgiven for thinking that there's very little left to discover in the modern world. Our species has been to just about every square inch on the planet we inhabit (and a few beyond it), and the Tweets, blogs and selfies are all online to prove it. 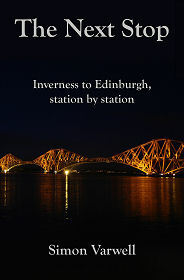 The real joy of "The Next Stop: Inverness to Edinburgh, Station by Station" by Simon Varwell is the revelation that with a little imagination and effort, it is still possible to devise journeys of discovery that are worth making. The key step is to realise that for something to be fascinating it doesn't need to be new to mankind, just new to the individual making the journey. Simon Varwell had for years been making the railway journey between Inverness and Edinburgh on a regular basis, but realised that he knew little about many of the places he glimpsed through the train window en route. In 2012 he set out to put that right. Over the course of six days he travelled by train to each of the twenty-three stations along the route and spent, usually, a minimum of two hours in each: often rather longer. This book is the story of his journey, told in an engaging style that allows you to see the places he visited through his eyes. For us it was doubly interesting as we'd been to most of the settlements along the line before, and there was a sense of anticipation, wondering how the author would feel about the places he encountered. The result is an ideal book for anyone who, like the author, has ever wondered what lies beyond the stations and the briefly glimpsed settlements along this line. The promotional blurb for the book reads: "It was a trip that led him to the unknown, the beautiful, the isolated, the depressingly mundane, the run-down, and the haunting." It would be fair to say that there were places that the author did not particularly like, and he pulls few punches in telling us why. But he is also open minded in his approach and tries to get under the skin of each stop along the line. In some places there was less material for him to unearth than in others. Nonetheless some fascinating stories emerge: such as the reason for the demise of a hotel we've sometimes wondered about in Dalwhinnie. Two thirds of the way through the book the author realises that his real contact with humans, beyond those selling him tickets, or accommodation or food, has been slight, and you get a sense of the loneliness inevitably experienced by even the most sociable of solo travellers.